No Comments on What Size Umbrellas Fit Into Glaro Wet Umbrella Bags? 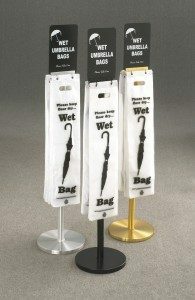 ­ Glaro Inc. wet umbrella bags are designed to fit umbrellas of all sizes, including standard and tote sizes. Glaro bags are 31” h X 7” w, making them among the largest umbrella bags available. A separate bag system is not required for tote umbrellas because Glaro bags are designed to accommodate almost any size umbrella, including totes. By using Glaro wet umbrella bags, visitors and employees will stay safer in areas such as lobbies and hallways by preventing dangerous slip and fall accidents that result from wet floors. If you are interested in purchasing wet umbrella bags, they can be purchased through a qualified Glaro distributor in single packs of 100 bags OR in 10 pack cases of 100 bags per pack. If you are looking for a professional neat appearance in public places such as lobbies and entranceways, Glaro Inc. also manufactures a full line of floor standing wet umbrella bag holders. The all-metal stands have weighted bases for stability, are designed for heavy duty use, and are offered in several attractive finishes. Give our sales team a call at 800-234-1050 to learn more.